This Tuesday, March 19, the Church celebrates the Solemnity of St. Joseph, Spouse of the Blessed Virgin Mary. 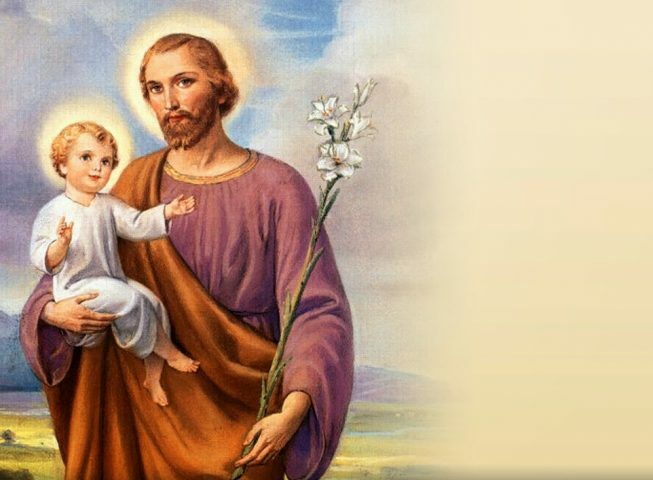 St. Joseph, entrusted as the foster-father of our Lord, is recognized as a special patron for all fathers and for the universal Church (which is the Body of Christ). As he is also our parish namesake, every solemnity honoring St. Joseph serves as a special patronal feast day for our parish and is a day worthy of celebrating. To celebrate St. Joseph’s Day, we will offer a special evening Mass this Tuesday, March 19, at 7 p.m., followed by a Sundae Bar in the Parish Social Hall after Mass. As St. Joseph’s Day is a solemnity, a celebration of the greatest importance, we are welcome to relax our Lenten observances on this day. We see this practice of celebration reflected even in our liturgy as this is one of only two days during the Lenten Season at which we will recite the Gloria together at Mass (the other being the Annunciation of the Lord on March 25). Outside of these two days, the Gloria, a hymn of praise, will not rise again from our lips during this penitential season until we rejoice together at the Easter Vigil. Following St. Joseph’s Day, we once again wholeheartedly resume our Lenten practices of prayer, fasting, and almsgiving as we continue in these forty days of penance.